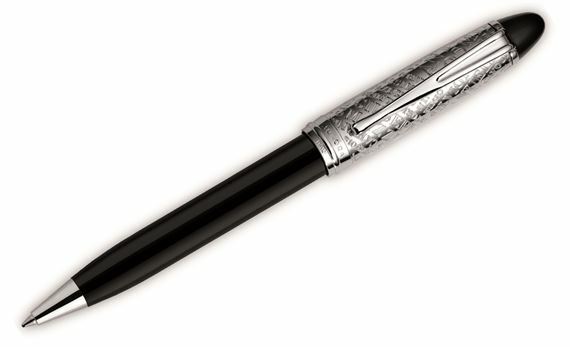 Order your Aurora Special Edition Italy 150th Anniversary Ipsilon Ballpoint Pen today from FahrneysPens.com. Fine Pens, Refills & Luxurious Gifts – great prices & fast shipping. To mark Italy's 150th anniversary as a unified country, Aurora presents the Special Edition Italy 150th Anniversary Ipsilon Ballpoint Pen! The familiar Ipsilon profile is graced with a gleaming chrome cap with engravings dedicated to those who have made Italian history: Mazzini, Garibaldi, D'Azeglio, Cavour, Cattaneo, Bixio, Vittorio Emanuele II and more! The meticulously designed cap highlights the polished black resin barrels on the fountain pen with steel nib in regular or italic medium point, push-top retractable ballpoint pen and capped rollerball. The limited production series is the best ballpoint pen to say "Happy Birthday, Italy!"